Join in the challenge by creating your own page. Have your family and friends donate based on your weight loss. The dollar amounts can be based off your per pound loss or use your imagination. The goal is to raise proceeds for LEGACY’s programs: Mentoring/tutoring with PACES (Wyandotte Mental Health), LEGACY’s 2012 Summer program (which has an initiative of keeping at least 100 disadvantaged youth out of harm’s way during peak violence and criminal hours), and LEGACY’s 36 week program. 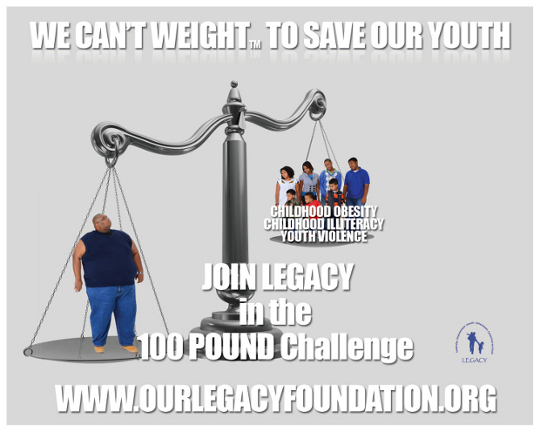 Both of these programs will teach children about literacy, obesity, financial literacy, business/school etiquette, college preparation, and much more. 7. Under the personal appeal section, you can provide your personal message as it relates to raising funds for the Legacy Foundation. Please don’t forget to mention some of Legacy’s mentoring programs which include: tutoring, mentoring, college preparation and much more. 10. Now you are ready to collect funds, please share with all of your social networks, facebook , twitter, email, etc. You can also add a profile picture of your choice. 3. Please share with your social network, Facebook, twitter, etc.